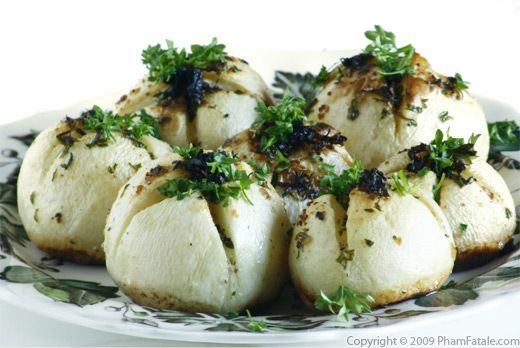 I wanted to cook a special meal for the opening of the movie "Julie and Julia". The Contra Costa Times even mentioned my Julia Child-inspired meal. Click on the photos to get the recipes. Pissaladière niçoise is named after the city of Nice, located on the Mediterranean coast in southern France. The dish is composed of all the typical ingredients from the region such as black olives, onions, garlic and a bouquet garni. It's quite similar to my tartelette feuilletée aux tomates cerises et trois pestos (3 pesto cherry tomato tartlet). 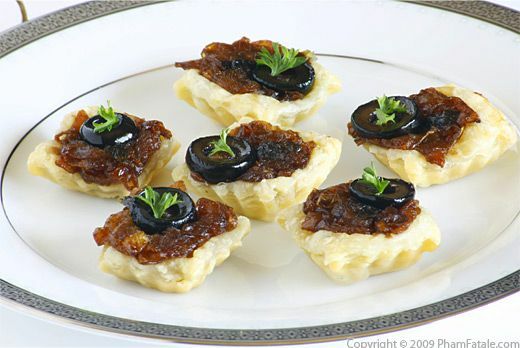 Another great amuse-bouche: Canapés au camembert are the perfect palate teasers. 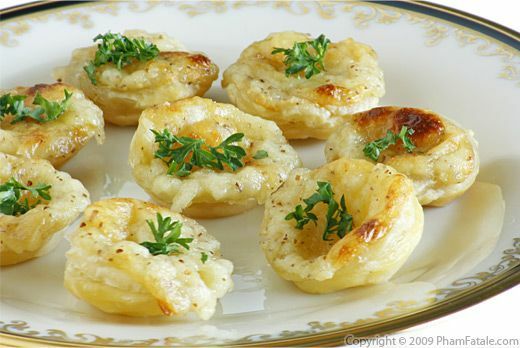 They have a flaky, buttery shell and are covered with a camembert sauce mornay, which is béchamel and some cheese. 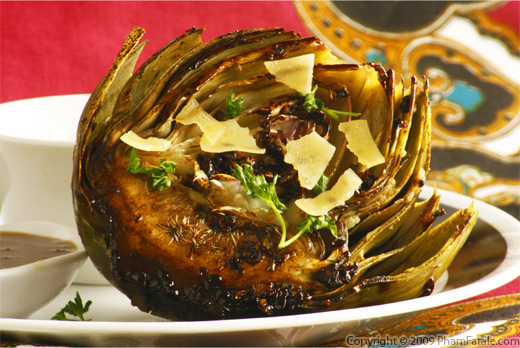 Pan-seared artichoke with balsamic glaze. This is a super easy recipe that looks like a million bucks on your table. Faisan fourré à la sauge et aux pommes vertes (roasted pheasant stuffed with sage and Granny Smith apples). 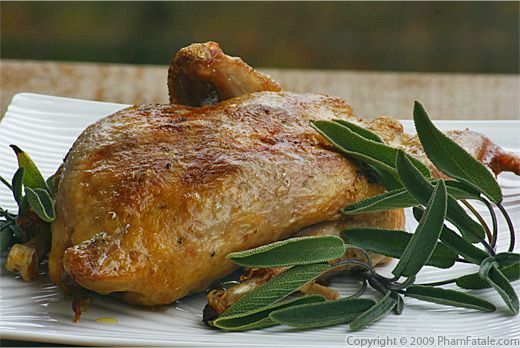 The name of the bird might seem intimidating, but the recipe is as "easy" as making a poulet rôti. Vichy Carrots. Carottes Vichy is named after the town of Vichy, located on the banks of the Allier River in the northern part of the Auvergne region in France. 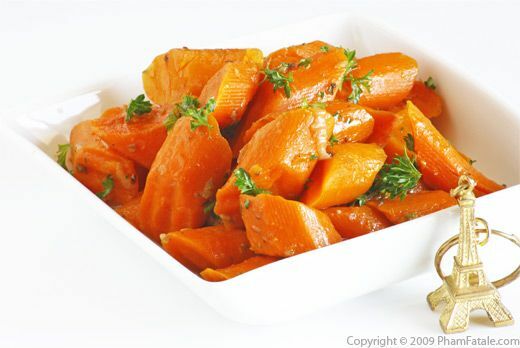 Vichy is famous for its numerous spas and its carbonated water, which is used in this dish to soften the carrots. Oignons à la crème. The trick to making this dish look great is to use the right serving dish. I like these individual serving containers. I got them from Staub. I also use them for making my gratin dauphinois. And finally some navets persillés. I roasted them and slathered them in butter. Very flavorful! I think clafouti (check out the recipe, I just posted it) is one of the most commonly found desserts in France after crème brulée. Clafouti is traditionally made with cherries; the fruits are baked in a custard, crêpe-like batter. Just sprinkle a little powdered sugar before serving and you'll get oohs and ahhs from your guests. You see, in France, a meal is not only meant to nourish yourself; it's a great occasion to chit chat with your family and friends around a delicious long meal. By the end of the meal, I guarantee that your guests are going to be rassasiés (it means well-fed, full in French). 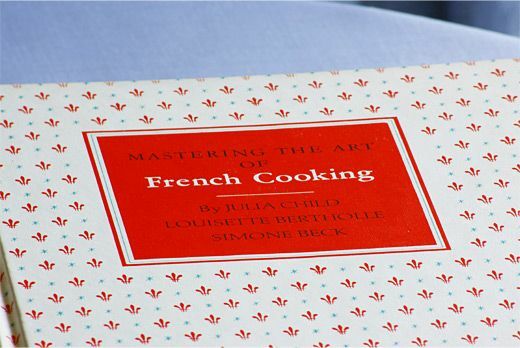 All the recipes were inspired by Julia Child's "Mastering the art of French cooking" cookcook. 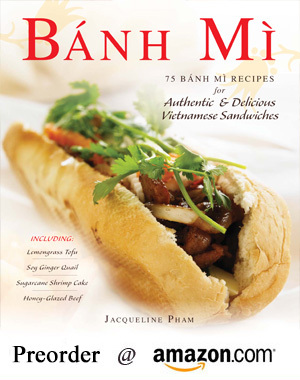 The book was graciously lent to me by my friend Carole who also edits the posts on PhamFatale. Carole received the book as an engagement present. There is a dedication inside the book that perfectly illustrates Julia Child's influence on homecooks. I'm going to watch the movie today with Carole. If you're planning to see it today too, share your thoughts about Julia Child / Julie Powell and Meryl Streep / Amy Adams' performances in the comment section. NEW FEATURE ALERT: PhamFatale.com is now available on your iPhone. Just go to http://www.phamfatale.com/m/. I'm very excited; an iPhone App will be viewable soon. What an impressive meal! I'm especially drawn to the dessert! I'm seeing the movie this afternoon with 10 Utah food bloggers! Amazing! Love the little note at the end as a testament to how great that gift was and how well it's been kept. Your 4 course meal looks absolutely incredible. I especially love the artichoke. And since you say it's easy, I might just have to give it a go! Enjoy the movie! What an awesome menu. Sounds delicious. What I like the most is the thought of sharing it with friends or family. With that many courses, it would (and must have) been an amazing evening. Congrats! I just posted something similar, but mine was just a meal, yours is everything, fabulous! I love the dedication letter :) Hope you enjoyed the movie, I am going to see it today. This meal is absolutely gorgeous! 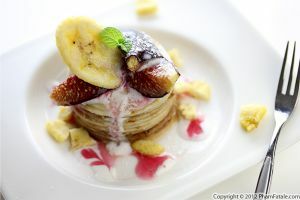 I will definitely be making a few of these recipes! what a great idea to celebrate the movie! I still haven't seen it and can't wait! Nothing like classical french. They all look pretty tasty, I have to go get Julia's book and try some of these esp. the artichoke. Thank you for your nice words. The pan-seared artichoke recipe is not in Julia Child's "Mastering the art of French cooking". In fact, none of those recipes are in her cookcook. There is an artichaut à la Provençale recipe but I decided to make my own artichoke version. You can find the recipe here. 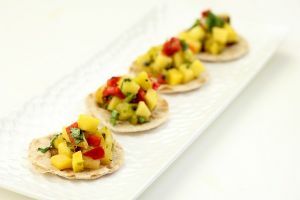 All the recipes in this post are available when you click on the photos. Oh Jackie...I am speechless. Gasp! This meal looks absolutely amazing. Every course looks so delicious. Your family is VERY LUCKY! Also, thank you for your comment on Chez Danisse. Thanks for the comments on my post! Your meal looked/sounded like a fabulous feast. I'm jealous! =) I'll be reading your blog! I'm excited! -- hope you'll do the same to mine! founding your website is one of the most beautiful discoveries of the year. Thank you for so many great inspirations! Can't wait for December to buy your book! You're brilliant and warm and gracious. Julia would have loved you, Pham.